Is there something called “self realization”? Is there a transformation of consciousness into something untouched by the the travails of daily existence? Are there certain qualifications to embark on such a journey and reach this state? Are some people privileged by birth, good fortune or grace to achieve such a state of enlightenment or liberation or Godhead , and others destined to imitate path set by few searching for second hand experience? Above all, a question more fundamental - Is there any at all called “spiritual” life, or is it just a well orchestrated assumption indoctrinated into our collective psyche for millennia, which nobody wishes to question? These are not questions only raised by atheist or agnostics, but these are questions which rises within each one of us some time or the other. In quiet moments of contemplation or sometimes quite expectedly, they jump at us from nowhere. And these are, no doubt, uncomfortable questions, because the moment they arise, our impulsive reaction is guilt or attempts to brush it aside and seek comfort in orthodoxy and tradition. We turn to a religious book, a sermon, a guru and seek solace in their embrace. As a human child, hapless and dependent on its surroundings for crucial formative years, we are indoctrinated into specific modes of religious thinking, propelled into spiritual practices which claim to take us towards the highest goal. Throughout this journey, we repeatedly feel dejected, unworthy - as the horizon keeps receding and we are no more close to the goal than we were at the beginning. As dissatisfaction sets in, we don’t pause to question the goal, but hop from one methodology to another, one guru to another, hoping a change of plan will provide a refreshing new path and practice. Unfortunately, no matter, how hard we try and how many systems or books we follow, the goal remains a goal with only vivid descriptions available of what it is like, but nothing really, to vindicate any of it in the realm of our own personal experience. At the most, we are bequeathed a sense of calm, inner resignation and suppleness of body, but original goal of God realization remains a dream and chimera which eludes very attempt. We remain vacillating, unbalanced, traumatized and nervous about what we are in day to day life, when compared to what we are supposed to be. Entire lifetimes are spent grappling this dichotomy, strangely, without once questioning the very premise. This is the tragedy of our spiritual quest. This essay is supposed to be about UG Krishnamurti, the most significant iconoclastic and system breaking philosopher India has produced for long time; but one cannot understand UG without the preamble of above paragraphs. Unlike his namesake J krishnamurti, whose teachings UG followed with great diligence in his younger days, UG did not leave behind any form of institution - either for learning or for practice. There is no UG way to spirituality. He did not write any books, did not give lectures, and the few videos and books in circulation are there despite his contempt for it. He is sparsely known in educated circles, and certainly unknown among lay devotees. In his long life of 87 years, he refused to meet people and discuss religion; yet hundreds of curious enthusiasts met him wherever he lived and drew him into intense and often vehement dialogues. He denied being an enlightened man, and he denied that there is anything of that nature available to Man. Academic, scientists, professionals - whoever came in contact with him, would return with deep of sense of angst and existential discontentment. UG’s authoritative presence, deep conviction born out of a life shattering experience ( which he refers to as a Physical calamity), would repudiate every known concept of religion and its heritage throughout history. The roller coaster ride of religion, of its glorious goals and visions, its stranglehold over people’s imagination and vitality, had completely severed in UG. There was no vestige of sanctity, as we understand it, in his presence. Meeting him was encountering a wild, primitive force in its uncoiled, aggressive and untarnished purity, unwilling to be categorized, pigeonholed and judgmental. Extremely refreshing to some, but deeply disturbing to many who held cherished belief systems. His words would hit like a thunderbolt, stirring questions that lay dormant and repressed. Some would emerge from these informal dialogues dazed and transformed, but majority would run away with fear never to return again. So who was UG? 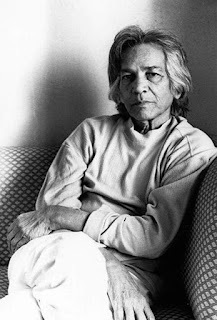 It is uncanny how both UG and JK ( two krishnamurti’s) shared a common heritage. UG was born in Andhra Pradesh to a family of wealth and prominence. Educated well, Introduced to religious practices by his grandparents early, he developed an interest in spiritual austerities and was mesmerized by the notion of moksha. Theosophy was a big crowd puller those days. With its esoteric combination of myth, science and history, it was the ideal refuge for those who reveled in cosmic mysteries. Leadbeater, Madame Blavatsky and later Annie Besant created a complex theology, which satisfied the vanity of the educated class. UG was sucked into it. As a graduate of English and philosophy from Madras University, an eloquent speaker, UG could have opted for a life of spiritual evangelizing. It was lucrative and popular. He was suited for it, and, in fact, did lectures tours nationally and internationally for many years as part of Theosophical society. During this period, he also spent time with renowned Indian gurus in the Himalayas practicing their version of mediation. At the age of 21, UG met Ramana Maharishi at Tiruvannamalai. By that time, UG was filled to brim with spiritual knowledge. His question to Ramana was similar to the one Narendranath asked Ramakrishna few decades ago. UG was dissatisfied, but somehow Ramana’s straight answer shook him to the core. He did not return with respect for Ramana, but he felt redeemed. At least, here was a man who was honest about the whole thing. Throughout his life, UG displayed scant respect for gurus of any kind, except Ramana. He would never openly talk about Ramana, but he never once disparaged his name either. From then on, UG’s life took the turn of an intellectual vagabond. He travelled the world listening to J krishnamurti, and learning from gurus in Ramakrishna mission. he talked , probed, tried to pin them down to something concrete. Nobody was willing to commit to anything. There was enough gurus to offer advice and solace, but none to categorically bring him to the doorstep of so-called truth. By this time UG was married, had kids, and also sent his family back to India from US. With little money he landed in Geneva Switzerland. He was almost broke and about to be deported, when an officer in the consulate, a lady, stuck by his unusual presence and candor , arranged for him to stay with her and organized his papers. This was early 1960. UG was 45, and still without answers to his questions. For three decades, he had run from pillar to post, from one guru to another, hoping someone would give him the state they so eloquently described. In 1967, JK arrived in Saanen, Switzerland for his annual talks. UG decided to attend. As he listened, a deep feeling of distaste arose, and it vividly stuck him with great force how somebody else can describe his state with more clarity than himself. If I am truly what is being described, then what is there to search. With this thought, he got up and left the gathering, never ever to return to any spiritual discourse. What happened to him was nothing like the descriptions of enlightenment he had heard. This was a physical phenomena, and nothing spiritual about it. The body had stumbled ( he used this word often) on its own intelligence without the crutch of thought and its manifestations. A natural state to function in this planet. Thats all there is to it. The important thing was this calamity happened despite UG’s preoccupation with traditional modes of spiritual quest. What happened was neither forced, nor willed, nor practiced. It was spontaneous, painful and least interesting. After all, the only outcome of all this was the body had rejected the impositions of mind, and thought was put in its right place - which is to react whenever appropriate to a given sensory stimulus. All fantasies about soul, spirit or God has nothing to do with Man or nature. Friends who met UG after the calamity noticed a surprising change in his physical appearance. He looked younger and calm, without the restlessness of search. A certain beatitude emanated from him - a mixture of intense masculinity and feminine dexterity. Intellectually, at 49 years of age, all that UG had learnt and practiced dropped away irrevocably from him. He would often say that he had not willed such an outcome, but it happened without his volition or intervention. To him, search for a spiritual truth just ended; not that he found it, but with the realization there wasn’t one. The stranglehold of thought and its need to perpetuate itself through goals had snapped. It returned to its original and natural state. UG passed away in 2007. Not very long ago. After the calamity, he divided his time between different countries as guests of close friends. Simple man, with limited needs, he would eat, sleep, talk when required in a group. He did not keep a diet, did not exercise, ate lots of ice cream, cooked his own mini meals and travelled with a cooking kit. He never suffered from any kind of illness and did not take any medication till the very end, when a fall down the stair broke his leg and triggered the eventual collapse. His conversations in later years often sounded little bitter. He criticized gurus of all kinds, especially JK - he reserved his choicest epithets (pun intended) for him. People who came to talk didn’t get anything to hold onto. He would openly belittle them and question their quest. He cared less, if they walked out. In fact many did. Orthodoxy was skeptical of his stand. To throw away millennia of indoctrination is not merely difficult, but very uncomfortable. When seekers came to him for answers, he offered none. And many times, repelled them with his answers. Like Zen masters, he had no patience for theoretical abstractions. Mahesh Bhatt, the film maker was a good friend of UG, and his biography “ UG Krishnamurti - a life” gives a good glimpse of UG as he was during his last days, slowly dying in a sea-side town in Italy. It also takes one down memory lane and fills in details about UG’s upbringing. A good book for those who are piqued to know more about this enigmatic man. In this essay, I intentionally stayed away from judging UG or his transformation. Its unto the reader to do. Personally, I think, UG’s message ( if one can call it that) makes one question. The directness of his appeal can reveal something we have refused to acknowledge. "I am not a God man; I would rather be called a fraud. The quest for God has become an obsessive factor in the lives of human beings because of the impossibility of achieving pleasure without pain. The messy thing called the mind has created many destructive things but the most destructive thing, by far, is God. God has become the ultimate pleasure. The variations of God, self-realisation, moksha, liberation, the fashionable gimmicks of transformation, the first and the last freedom and all the freedoms that come in between, are pushing man into a state of manic depression".